There are plenty of superhero slot machines around but there’s always room for one more, especially if it’s a Marvel slot from Cryptologic which of course features their Marvel progressive jackpot. This one is based on the Marvel comic and film, Fantastic Four, which relates the story of four scientists exposed to gamma rays in space and given interesting superhuman powers. You can read about Playtech‘s more recent version of this slot here. Mr. Fantastic – 15 free games with a 2x multiplier; Mr. F appearing on reel one will expand to cover the whole reel. Invisible Woman – 10 free games with a 3x multiplier; Invisible Woman on reel two will award more free games. The Thing – 15 free games with a random multiplier between 2x and 10x applied to each win. Human Torch – 10 free games with a 3x multiplier; more Human Torch wilds are added randomly during the free spins. Dr. Doom – unlimited free games are awarded until Dr. Doom appears on reel five to end the fun. As you can see from the video below it’s not always a guaranteed money maker. As with all Cryptologic Marvel slots all players will be eligible to play the Marvel Jackpot; it’s awarded randomly but you’ll have a better chance if your stakes are higher. If you do get lucky you’ll have the chance to win the Hero Jackpot, the Superhero Jackpot or the Marvel Hero Jackpot. 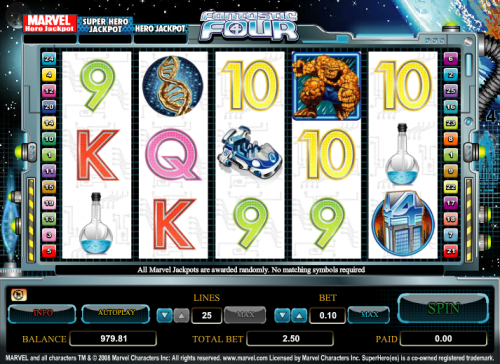 Fantastic Four maintains the standards set out in Cryptologic’s other Marvel slots and it’s an enjoyable enough diversion with the multiple bonus games adding an extra something. It’s possible to wager as little as €0.01 on one payline up to €250.00 per spin with everything maxed out.